After a strongly worded statement from United States Ambassador to Germany, Richard Grenell, the German government has disallowed a planned anti-Semitic "Boycott, Divestment, Sanction" event in Berlin, and expelled its headline speaker, convicted Palestinian terrorist Rasmea Odeh. The Jerusalem Post reports that the German government and the Berlin Department for the Interior responded quickly to international outcy following the announcement that Odeh was set to speak at a "Palestinian Women in the Liberation Struggle" in the country's capital city, even after initially pledging to allow the event to go forward. 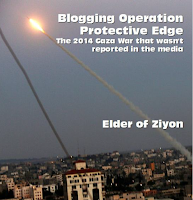 The elderly Odeh remains a hero to anti-Israel activists across the globe, and has fans in both Congresswoman Rashida Tliab (D-MI) and Women's March leader Linda Sarsour, according to William Jacobson at Legal Insurrection. No surprise, both women have been known to express anti-Semitic views. Ireland, as a European Union member state, is subject to the EU's commercial rules. EU trade rules may prohibit Ireland's unilateral action as an EU treaty requires common commercial policy for all EU member states. The proposed law "could force US companies with Irish subsidiaries to choose between violating the Irish law or violating US Export Administration Regulations." — Orde Kittrie, Professor of Law, Arizona State University. Worst, there is no evidence that Ireland's "pro-Palestinian" activities are in any way helping Palestinians, who continue to be arrested, tortured and deprived of any viable future by their own corrupt leaders. 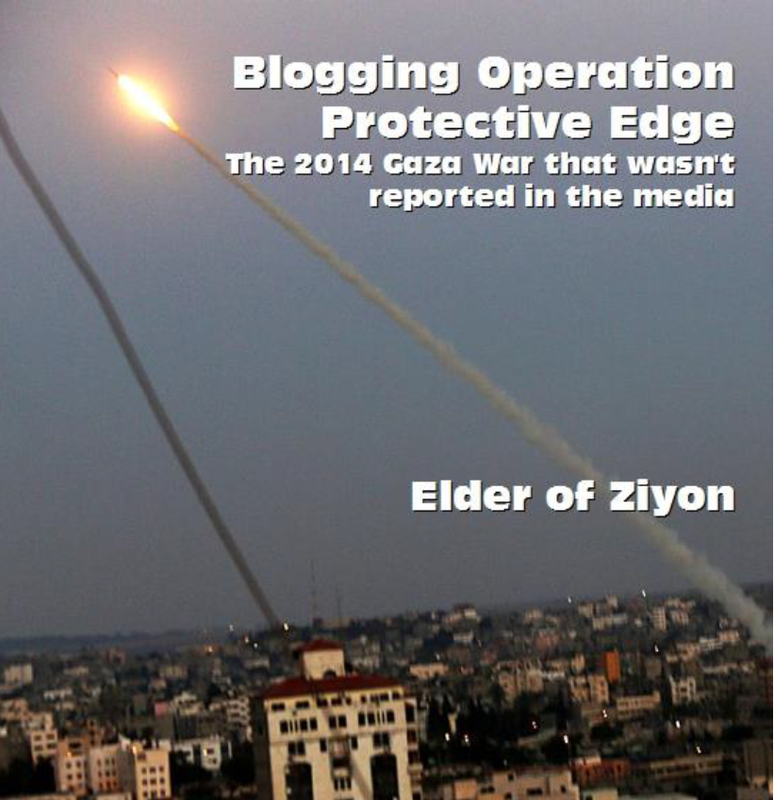 Most European activities seem actually focused on trying to destroy Israel. What is most notable, of course, is that there is no commensurate hostility toward any other country. Ireland's rancid vote also needs to be contrasted to its virtual silence regarding countries that are daily committing hair-raising crimes against humanity, such as Iran, China, Turkey, Syria, North Korea, Russia, Saudi Arabia, Nigeria, Mauritania, Cuba, Venezuela or Sudan, for instance. Why only Israel? What is now on display is simply a hypocritical condemnation by Ireland of the only democracy in in the Middle East with equal rights for all its citizens. What is essential is that this double standard -- one set of rules for Israel and a whole other set of rules for countries actually committing atrocities -- must stop. Dweik and Asaf, who eventually posted a video of the interaction that went viral, did not. They later went on social media to drag Clinton further, saying her mere presence at the memorial service was insulting. "[I] was on the verge of tears all day today and actually cried on my into and during prayer but the charade of a vigil where more non-[M]uslims than [M]uslims spoke and [C]helsea [C]linton was invited made me so viscerally angry and [I] will not apologize for that," Dweik wrote. In the piece (click at your own risk), Dweik and Asaf accuse Clinton, without any apparent evidence, of using her platform as the daughter of a former president to “fan those flames” of a “bigoted, anti-Muslim mob," apparently referring to the wide swath of commentators who criticized Omar for repeatedly trotting out the anti-Semitic "dual loyalty" smear, accusing Jewish legislators of having divided allegiance to both the United States and Israel. Dweik and Asaf, of course, defended Omar's comments, claiming that Omar was merely "speaking the truth about the massive influence of the Israel lobby." The comments aren't surprising. 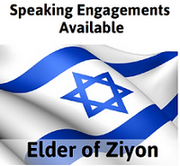 Dweik, at least, is no faux "anti-Zionist"; she has spoken before about "demolishing Israel." Worse still, Dweik and Asaf went on to accuse Clinton of “stok(ing) hatred against” Muslims and fomenting the “anti-Muslim bigotry” that “created this killer" — the man who killed at least 50 people at two separate mosques in New Zealand. The pair accused Clinton, even, of hurting their fight against "white supremacy" "when she stood by the petty weaponizers (sic) of anti-semitism." It was revealed that in 2012, she tweeted that Israel had "hypnotized the world," and asked that "Allah awaken the people and help them see the evil doings of Israel." After an initial attempt to defend the alleged intent of the tweet, Omar has since apologized for the language that she used in 2012, writing: "It’s now apparent to me that I spent lots of energy putting my 2012 tweet in context and little energy is disavowing the anti-semitic trope I unknowingly used, which is unfortunate and offensive." Following her apology, the congresswoman defended her right to criticize governments, quoted Martin Luther King Jr., and wrote of the "many narratives" regarding who she is, which are allegedly "designed to demonize and vilify [her]." Rep. Omar has ignited controversy on multiple occasions since her election. The storm surrounding her repeated anti-Semitic remarks (which you can read about here) became such a point of contention that the House of Representatives actually passed a resolution denouncing "hate." 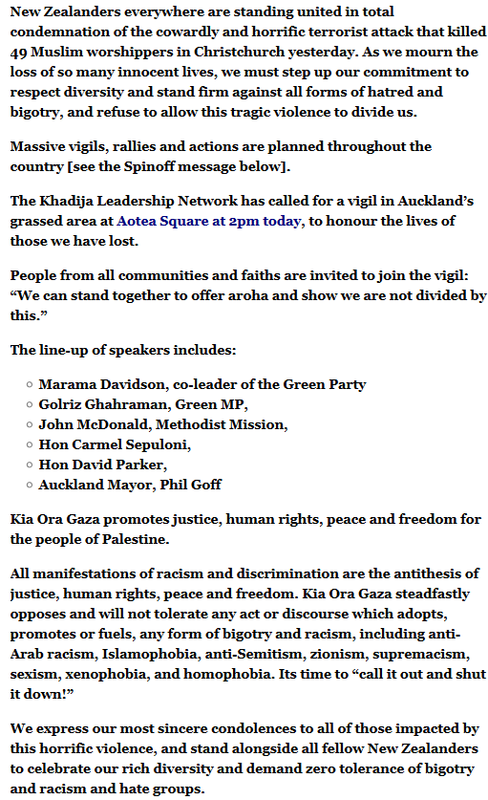 Following the terrible Christchurch atrocity, the Kia Ora Gaza website drew attention to a vigil in Auckland, addressed by, among others, New Zealand Greens MP Marama Davidson, who as the foregoing link shows is a "Freedom Flotilla' alumna. Here's a screenshot of the original version. 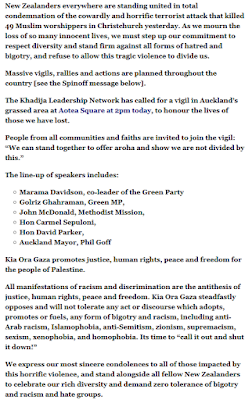 Note that penultimate paragraph, the one that includes "zionism"among the forms of "bigotry and racism" that Kia Ora Gaza deplores. And here's a revised version, with "zionism" removed and the adjective "white" now qualifying "supremacism". Or did Mr Fowler have, independently, his own (as it were) "Road to Damascus" moment, and realise that the national aspirations of the Jewish People are justified, and that hate speech against the State of Israel is not warranted after all?